Today, Benn has started moving our things over to Ipswich, and it finally feels like she is ours — our little Oceanic 30, Pas de Deux. All in all, the time span between deciding to get a catamaran, selling our narrowboat, and buying Pas de Deux has been relatively short. It’s only been 4 months since we first had that conversation in Pin Mill and started talking seriously about trading in our life on the river for one on the seas. It has seemed long, however — and frought with all kinds of horror and anxiety and despair. Some people spend their whole lives trying to find the right boat. 4 months almost plunged us into depression. We’re not patient people. But, we’re extremely happy with our little boat. She’s no 60 ft. Lagoon, nor fancy superyacht. She’s more like the Volkswagen of catamarans. She’s not a Ferrari, but are you really going to circumnavigate the globe in a Ferrari? Probably not. Compact, reliable, and completely bare of all those annoying bells and whistles. What more could you ask for? We didn’t immediately set out looking for an Oceanic 30. Our first choice was actually a Prout. Dependable, safe, and over-built, the Prout Quest 31 seemed to be a perfectly sensible option. We liked the layout, it was almost in our price range, and, as far as boats go, they seem very good — not a floating luxury apartment, but we don’t even want a stationary luxury apartment, so that’s fine by us. Unfortunately, none of the Prouts we came across were right. The ones we found that we could afford were in pretty bad shape, and, although we’ve never been opposed to some hefty DIY, we are by no means prepared to spend the next 2 years throwing our time and money at a boat that needs more than we’re willing to give. When Benn found Pas de Deux online, we were ready to start investigating other makes. We didn’t know much about Oceanics at the time, but preliminary Internet research seemed encouraging. Sure, she was a little scruffy-looking and cheap enough to make us wonder what was wrong with her, but we figured there was no harm in having a look. 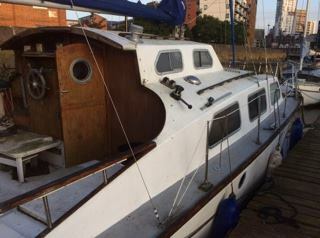 Benn drove 3 hours to see her in Portsmouth, but when he arrived, the broker said that he’d forgotten that the boat was actually moored in Ipswich — about 2 hours back in the direction Benn had just travelled. “No big deal,” he said. “The boat’s so bad that there’s really no point in going to see her.” Although one would assume that this would not be a particularly effective sales technique, it kind of worked out for the guy in the end. The following week, Benn went down to Ipswich — and she was perfect. Not perfect. “A bit tatty,” Benn told me. As you can see from the photos below, the interior needs a bit of work, and the exterior could stand a mighty good clean. But, otherwise, she seems just fine. Look at that spacious saloon! Besides, the Oceanic 30 is no mean boat — it was the first catamaran of its kind to circumnavigate the globe. In terms of interior comfort, it turns out that it is not only 2 ft wider than the Prout Quest, but also offers standing room throughout the cabin space and 2 proper full-sized double berths (as opposed to the suspiciously narrow “doubles” found in a lot of smaller cats). Admittedly, I haven’t even seen the boat yet, but Benn says that it feels so bright and spacious and airy inside that our 40ft narrowboat dwarfs in comparison. The previous owner bought her 3 years ago, planning to do pretty much the same voyage we’ve sketched out for ourselves: to cross the Channel, motor down through the canals of France, sail around the Mediterranean, and then cross the Atlantic into the Gulf. He even did extensive work on the boat in preparation, replacing the rigging, repairing the sails and the delamination in the roof, and fixing damage to the rudder. As it sometimes happens, however, his vision never quite materialized; things fell apart, he went through some rough times, and he decided to pass the boat along. He had been trying to sell it for a few years, but just hadn’t been able to find any buyers. Never one to shy away from a good chat, Benn asked around about the boat. The rigger at Portsmouth remembered the owner doing tons of work on it and had even been the one responsible for doing the rigging, so that part of the story checked out. The owner of the marina in Ipswich told Benn that, in his opinion, the only thing wrong with it was that it was dirty — and the survey seemed to agree. OK, yes, the survey was 3 years old, and, yes, the boat has been more or less sitting there in the meantime, but we were never going to find this boat — our boat — for that price again. We bought the boat through an unconditional sale for an incredible price. I admit that this sounds a bit risky. The boat is cheap — someone clearly wanted to get rid of it. And here we have two relatively inexperienced sailors (well, one of us is actually a completely inexperienced sailor, the other one had a lot of sailing experience about 20 years ago) with only the haziest understanding of seaworthiness throwing all of their money at a fiberglass bathtub on the basis of an old survey and an excessively optimistic hunch that this is the boat for them? All of these objections are running through the back of my mind, as well. However, while it may sound silly to someone who doesn’t know him, this is the sort of thing that you can trust Benn to know about, even if he doesn’t really know about it. My husband not only has an unparalleled talent for sniffing out deals, he can also communicate with machines — as in, he actually converses with them through some bizarre form of empathetic telepathy. He knows their needs, their wants, their most intimate dreams and desires. The source of this talent remains obscure (Is he psychic? Part machine? ), but the truth is that he is just extraordinarily good at knowing if something works or doesn’t work. Something in him spoke to Pas de Deux and she spoke back and they came to the conclusion that we could work something out. This, combined with the fact that he is maybe the cheapest most economical person I have ever met, means that if he says something is worth buying, it just is, survey be damned. Which is nice — for Benn, as he is the one who is in the UK right now and therefore tasked with the responsibility of cleaning and fixing up the boat so that it will be liveable when I arrive. This isn’t our choice — we can thank the UK Customs and Immigration for that — but I still feel more than a little guilty for not being there to suffer through the bleach fumes with him. So that I’m making at least some kind of contribution, I’ve been working on setting up this blog, complete with Pinterest page, Facebook group, and YouTube channel which will soon feature our very own video blog (or, vlog, as the kids started calling them, oh, 15 years ago). I’ve signed us up for a 6-day course in November to get our Catamaran Bareboat Skipper certificate and am starting the joyous process of obtaining my UK spousal visa so I can reunite with man and dog and boat in the month of December. The first step has been accomplished. We have our worthy vessel. Previous The Boat Is Ours! Great blog. Looking forward to keeping up with your journey! I had visited this boat too – maybe 5 weeks ago. But for me this project was a bit to hard, because I would have to bringe the Oceanic to Germany to get her ready. Now I’m still looking for another boat with similar size. But nice to know that this Oceanic will became a new live – and probably the friendly previous owner is happy to sale her. Good to read about your Page – I`ll follow a bit. Best regards and goog luck. Liked your videos, will follow your progress, I am interested in the Oceanics, and other British catamarans. Interested in what you do with the refurb, good luck.